In my previous post about the putz village, I mentioned a "lacquer" that I had heard about. The product creates a ceramic appearance to whatever it is applied to. 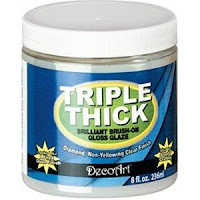 I couldn't recall the name, so I had to do a bit of research and came up with Triple Thick brush-on gloss glaze. I'll post my findings after I get around to making the next village. What kinds of glazes, paints, varnishes, etc. 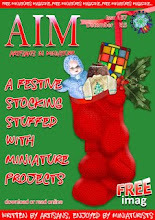 have you found useful in achieving the "right look" for your mini projects? There's a pic in my blog of a side table which I've painted with Waco glass paint - excellent stuff, didn't have to sand the table at all. The paint leaves an excellent smooth finish that looks fab laquered mahogany. 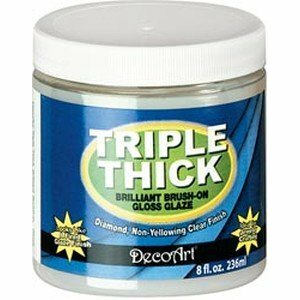 I have to see about this Triple Thick, if there's a shop that would send it here, as we don't have it here. I think that in Italy the name is Triple Gloss. It is a gloss who give to object porcellain gloss. I have thought that if the Chrysnbon Bathroom fixtures (tub, toilet, sink) were well painted and had a glaze on them they would look even better. Thanks for this post. I am going to try it on painted plastic to see if it will have the effect I am going to try to get on those pieces. Fabulous link, thanks, Carol. That looks really useful. Because I'm a painter, I tend use a variety of acrylic mediums and glazes -- thick and thin, matte to glossy. I've just started playing with model airplane dope for wood finishing, where you can dilute it for different effects. Getting the surface right is so important, isn't it? That does sound interesting and look forward to seeing your results. Have only used folk art paints and mediums mostly so far, find them useful for furniture and also painting aged effects on pots etc. Oh, I've also used metallic hobby paints on my candelabras but not totally sure I am happy with the effect, looks a bit too 'plastic painted'. Catherine, I've often thought the same thing about the Chrysnbon bathroom set, but I hadn't thought about using Triple Thick on it — that could really make the plastic look more realistic. I have a kit in my stash...now I'm motivated to finish it! Nina, model airplane dope sounds interesting! Please share your results. I'd love to see what you come up with.